Enjoy renting this 1950’s themed historic homestead with all the modern bells and whistles. There are 4 bedrooms that sleep 11 people comfortably and 2 beautiful, spacious full bathrooms (one with a Jacuzzi tub) with a total of 5 TVs. Free Wi-Fi, Air Conditioning/Heating, washer & dryer with laundry soap, Iron & Ironing board, outdoor grill, linens & towels, and hairdryers are just some of the additional amenities offered. The kitchen has 1950’s Retro looking appliances (with the comfort of today's appliances) in the traditional baby-blue colors with pink walls and black & white tile floors. Kitchen pots, pans, blender, crock pot, utensils, coffee maker, microwave, dish soap, paper towels, etc are provided in addition to service for 24 people. The main level has the master king bedroom and a secondary queen bedroom. The second floor has 2 bedrooms, a pull-out Futon, and a family/play room with TV, tables, chairs, games and a PlayStation. The former Summer Kitchen located adjacent to the home has been turned into a recreation room complete with a combination poker & bumper pool table, classic Coca-Cola refrigerator, AC/Heat, and 55 inch TV. The outside porch, complete with an old fashioned swing for two, allows for great people watching being right on Main Street. This Rupprecht Homestead is just two buildings South of Frankenmuth River Place Shops, less than a 2 minute walk. Five designated parking spots at the home allows you to keep your car in one place as you walk through beautiful downtown Frankenmuth, of which you are located in the heart of. If you decide to drive, everything in town is within a 10 minute drive. The popular Birch Run Outlet Mall is approximately a 15 minute drive. This house is ideal for families or groups of adults looking for a "get-a-way". 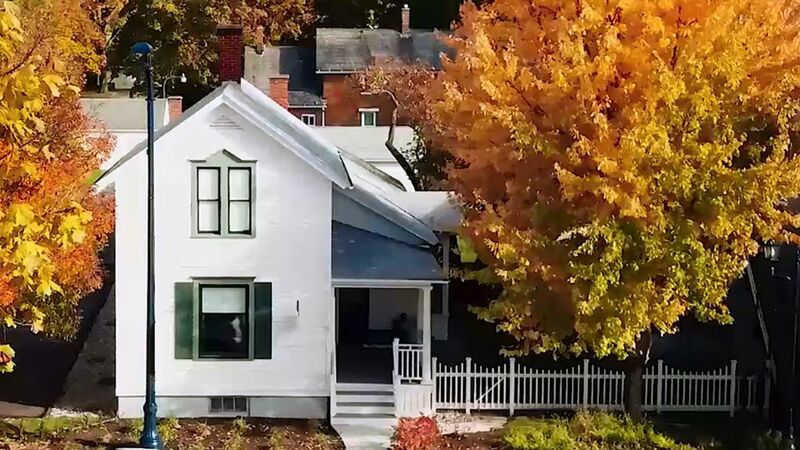 Enjoy the charm of this transformed 1950’s home and of Frankenmuth "Michigan's Little Bavaria" to see why it is the leading tourist destination within the state of Michigan. After staying in the Rupprecht Homestead, you won't want to stay anywhere else in Frankenmuth. toilet, combination tub/shower, jetted tub, Recently remodeled full master bath on main level. The washer/dryer unit is located in the master bathroom on the main level should you need it. The Rupprecht Homestead is located within the Heart of Frankenmuth. Very convenient to walk everywhere. For driving, everything is located within a 10 minute drive. Depending on when you visit Frankenmuth, you may see the quaint city with a 4,800 population. Or during festivals/events the excitement which brings over 3 million people/year to this town. Central AC within the house & summer kitchen. Heating within the house & summer kitchen. Fresh linens will be set prior to your arrival. Also a spare set is stored within the closets near each bed. Washer/Dryer combo is located in the Master Bathroom on the main level. We include laundry soap for your convenience. Free Wi-Fi available. At the house, you will receive the password. Towels of multiple sizes are located in each bathroom and kitchen. Extra towels are stored within the closets. Large living room with multiple seating options and a large flat screen TV. Within the kitchen is a retro table that seats 6 and a counter top that seats 2. We have casual and formal service, together for 24 people. 1950's looking kitchen with retro appliances that ALL have the modern conveniences we enjoy today! Kitchen pots, cooking/baking pans, blender, crock pot, serving platters, etc. provided. Beautiful wood dining room table seats 10 (6 formal chairs + 4 folding chairs). Retro kitchen table seats 6. Highchair & booster seat for children provided. Folding chairs in closet & recreation room. 5 flat screen TVs are located at the Rupprecht Homestead. A PlayStation4 is located upstairs for your PS4 games or DVDs (also plays Blue Ray DVDs). Remember back in time with some of the books, cookbooks, and magazines from the past. 2 game room areas: Upstairs with 2 tables & chairs to enjoy games, TV, PlayStation, etc. The Summer Kitchen adjacent to the house is now a Recreation Room with poker/bumper pool table, 55" TV, etc. Upstairs within the closet are a variety of games, some "old school" and some new, for you to enjoy. Bumper Pool Table located within the Recreation Room. Behind the house is a nice large lawn area with our ladder game & corn holes for your use. We also have beautiful ivy & grapes growing around the Recreation Room. Front patio overlooking Main Street has a wonderful "old time" swing for two to relax & unwind. Also great people watching being in the heart of downtown Frankenmuth. There are stairs at the front and rear entrance. Enjoy your stay in this 1950's historic homestead with all the modern bells & whistles we all enjoy today. Everything has been provided for you except for food, your clothes/toiletries, and of course.... YOU. Please use the entrance at the rear of the house. The password for both the house & recreation room will be sent to you prior to your arrival. Contact us if you have any questions regarding this homestead or the area of Frankenmuth. This house was beautiful and so cozy. All the beds were very comfortable. The location was perfect. We will be back!! Over the past year or so we have watched the vacation home be renovated for guests to use, so it was really fun to have the opportunity to share it with the team for a girls weekend of crafts and fun!! It is a beautiful place and has everything that a group needs for a weekend or vacation. The Cobbler's Bench is right next door to us. What great neighbors. They are known as a premier supplier of custom foot products. So glad they enjoyed their visit at our house and the opportunity to relax, do crafts and socialize. Another great visit to Frankenmuth!! Perfect place to stay! We live on the other side of the state but have spent our Thanksgivings in Frankenmuth for about 20 years. Now our children are grown, and some are living far away from us - but we get together every year in this sweet town to celebrate Thanksgiving and being together again! The Rupprecht House is perfect for us - lots of room and a perfect location - thanks for a lovely stay!!! We love being part of your family's Thanksgiving tradition. Thanks for sharing and bringing so much joy to the house. This home was welcoming, clean and awesomely decorated. Everything was there that we needed for 7 adults and a 6 month old. There was even a high chair. The beds were comfortable. The linens were high quality and there were plenty of towels. The kitchen was well stocked and the entire reservation went without a glitch. I would definitely go back and I highly recommend this home. It was perfect for a family getaway in Frankenmuth. Thanks for the beautiful review. So glad it worked out so well. See you soon. We really enjoyed our girls weekend at the Rupprecht home! It has spacious rooms that are nicely decorated. The location was within walking distance of many attractions and there was ample parking. We enjoyed our weekend shopping, dining out, relaxing, catching up, and laughing. It was great!! Thanks for the kind words. Glad you had a great ladies weekend. This house is a really cute retro 50's theme. It is the best, most well equipped home we have ever stayed at. There were plenty of shampoos, soaps, linens, dishes and utensils etc for the entire stay. One niece dressed in 50's attire for pictures. We had a great time in this home away from home. We would definitely return if we are in thre Frankenmuth area. Come to Frankenmuth and see why this town is Michigan's leading tourist attraction. There is ALWAYS something to do in "Michigan's Little Bavaria". For more detailed information on the different events, please visit: www.frankenmuth.org. Rates are subject to change until the reservation is booked. During events/festivals in Frankenmuth, there is a longer minimum night stay and higher rate due to demand. If interested in reserving beyond dates listed, please contact us directly. Check in is at 4pm and check out at 11am. We look forward in having you stay at the Rupprecht Homestead!